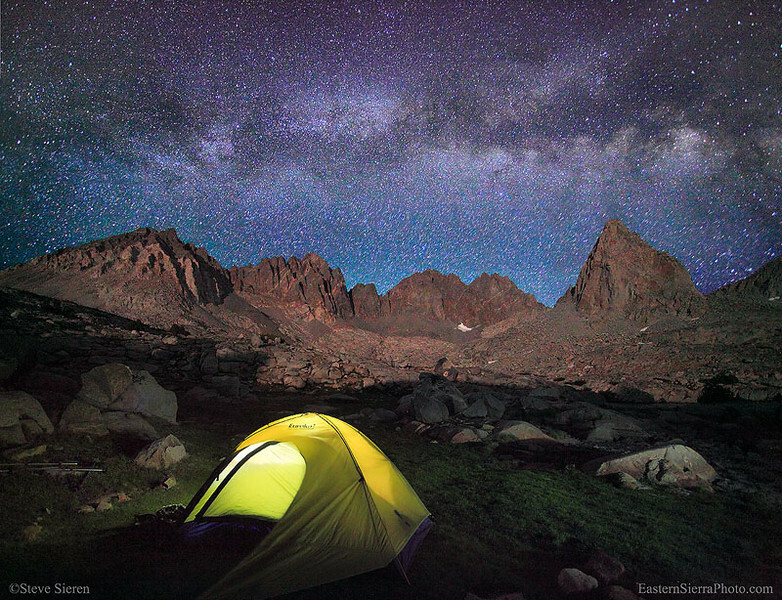 Backpacking in Kings Canyon under the Milky Way. Had a little teamwork on this one, Christina had her headlamp set up in the perfect spot with out knowing it! She was feeling the altitude on this trip so I had to carry a little more then I expected to keep her moving along. With the strong winds out I thought Christina might of wanted to turn around but she toughed it out and I’m glad! I came to shoot the alpen glow but think I like the night view more then the day stuff. This little old tent is about 10 years old and this may be it’s last photo. Too bad we don’t get the trade ins on tents or customer loyalty discounts!! It certainly lasted a lot longer then I though they would have, it was less then a 100 bucks and all I could afford at the time. I’ll get a lighter one next time! It was a cool trip, meaning on the cold side. We didn’t jump into any of the mountain lakes or broke much of sweat because there was a constant breeze to keep our temps cool while hiking. Christina saw her first yellow bellied marmot and thought it would make a great friend for her pet dog to play with, that would be funny, a giant chihuahua playing w/ a marmot! We pitched the tent up next to the tallest boulder to block the wind, it’s blurring parts of the tent in this shot but it was stretched out pretty far with guy lines so you can’t really see much blur in it all unless you look closely. This was just a random unplanned shot where I knew I could use the 3 different layers make the scene work and fill the frame with interesting subject matter. The Sierra has been pretty cloudless this late spring and early summer season. I love to frequent the places I shoot to get know the weather that isn’t the same every year. Some years we have almost cloudless summers and some we get more then the usual fair of afternoon thunder storms. I love going light with out a tent but haven’t been caught in a rain, hail or thunder storm with out a tent, but maybe someday I’ll get pelted to no end by baseball sized hail!! Have you ever been caught without a tent while backpacking? This entry was posted on June 25, 2012 at 7:31 pm and is filed under Uncategorized. You can follow any responses to this entry through the RSS 2.0 feed. You can leave a response, or trackback from your own site. July 16 – July26 on the JMT. I will NOT take suggestion to leave the tent behind. I like it warmer and it does rain even in July ! I love the picture and the mountains aglow ! Hey Dennis, only 10 days for the JMT, you’ll be zipping through there! I have a limit, no more then 3 days with out a tent for me. I’ll still keep a tarp on me at least when I do that. We did get some snow up there middle of the week a couple of weeks ago. Good luck out there Dennis, will you have a spot device on you? Or no LoJack for us internet watchers? Steve: Last year we three went Yosemite (& half Dome) to Red’s Meadow in October. This late July is Red’s Meadow to the little known Taboose Creek. Slow trip to photo everything. This year uno amigo is coming so no Spot or phone on this 98 mile “park walk”. Ansel Adams clouds yes but without rain, please ! love the shot Steve, I cant seem to find a good location over here on the east coast within my distance… cant wait to come back to the west and start getting some shots again. Always like these tent shot they really bring you into the scene.